Sydney: Australia were 24/0 at the stumps on day two of the fourth Test against India on Friday.As declared their first innings on 622/7, which was second highest total in Australia, the hosts played cautiously and ended up with no loss on the second day. Now, Australia is trailing India by 598 Runs. Marcus Harris (19*) and Usman Khawaja (5*) are still at the crease. Australia have three complete days to save the Test match.Earlier, Rishabh pant (159 not out) and Cheteshwar Pujara (193) guided India to cross 600 marks as India declared their first innings on 622/7. 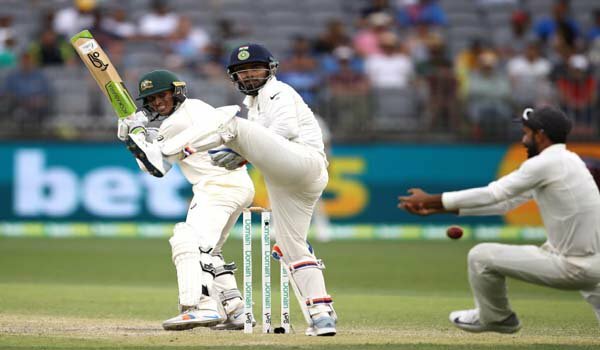 Ravindra Jadeja (81 runs) missed out on a Test century as he lost his wicket to Nathan Lyon.For Australia, spinner Nathan Lyon was the only wicket-taking bowler on day two, as he claimed three wickets in Hanuma Vihari (42), Cheteshwar Pujara (193) and Ravindra Jadeja (81). Pujara also missed out on double-hundred as he was dismissed by Nathan Lyon on a score of 193. Cheteshwar Pujara with 521 runs also leads the chart of top run-scorers in the 2018 Border-Gavaskar Trophy, while captain Virat Kohli is second on the list with 282 runs. On the opening day, India made a strong start by ending at 303/4 in 90 overs on the first day. Opener Mayank Agarwal was another solid performer, continued his good form with a 77-run knock. For Australia, Josh Hazlewood claimed two wickets, while Mitchell Starc and Nathan Lyon took a wicket each. Later, Australia were also rewarded with the wickets of KL Rahul, Agarwal, Virat Kohli and Ajinkya Rahane, but Pujara continued to score with his bat.